by: Stefano Musacchi, Professor, Tree Fruit Physiology and Management; Ines Hanrahan, Washington Tree Fruit Research Commission; Karen Lewis, Regional Extension Specialist, Tree Fruit; Kate Evans, Professor, Horticulture; Tianna DuPont, Regional Extension Specialist, Tree Fruit. 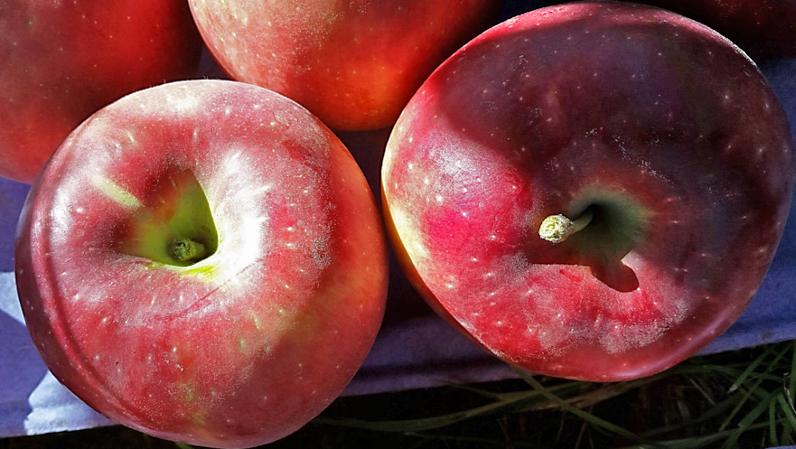 WA 38 is the result of a cross between ‘Enterprise’ and ‘Honeycrisp’ that was made in 1997 by Washington State University’s apple breeding program. 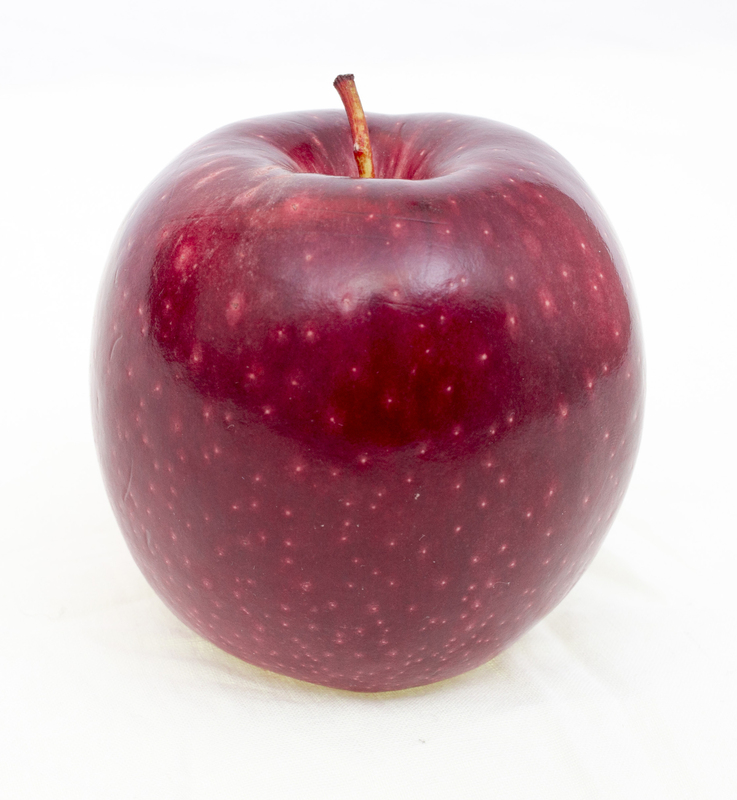 WA 38 was patented by WSU and will be sold under the brand name of COSMIC CRISP®. Here we will cover growth habit, establishment considerations, training systems, pruning techniques, cropload management, fruit type and fruit quality. Tree Habit. 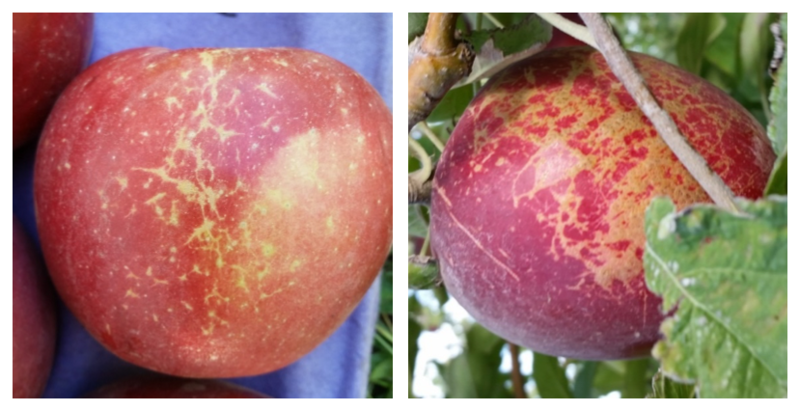 WA 38 is a type 4 tree like a Granny Smith (Figure 1). It tends to have long branches and produce blind wood near the trunk. It is a reasonably vigorous variety which can be managed with cropping. Bloom. WA 38 produces a lot of secondary lateral blooms. Laterals can be 40% of the total cluster. Tree fruit have two types of buds, terminal and lateral buds. A terminal, sometimes called the apical bud, is located at the tip of a shoot. A lateral bud forms along the developing shoot at the base of the leaf blade. Lateral flower buds bloom after the terminal buds and in a cool spring many lateral buds will lengthen the time between primary and secondary bloom. Figure 1. 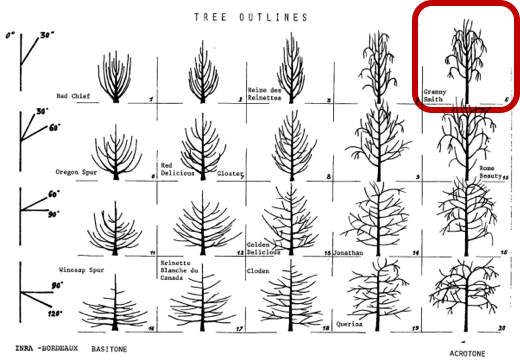 Tree habit classification diagram. (From: Lespinasse et al., 1985). The bloom period for WA 38 is late during the bloom period. There is little apparent difference in bloom timing on 1st versus 2nd and 3rd year wood compared to some varieties which tend towards a more consolidated bloom. The blooms are generally self-thinning which makes it important to have a pollinizer blooming during bloom. Fruit type. WA 38 is a bi-color fruit and needs uniform light exposure to develop good color. The training system you choose will affect the amount of light that is intercepted and how it is distributed throughout the canopy. Low light locations in the canopy will produce poor colored fruit. It is important to match the tree training, pruning and thinning techniques as well as pollinizers to the tree habit. On the right rootstock, WA 38 will perform well at all elevations in Eastern Washington. The bloom period and harvest period are a good fit for both early and late districts. Netting or evaporative cooling will need to be installed in the warmer parts of the state. WSU evaluated WA 38 on two different rootstocks M.9 Nic 29® and G41. 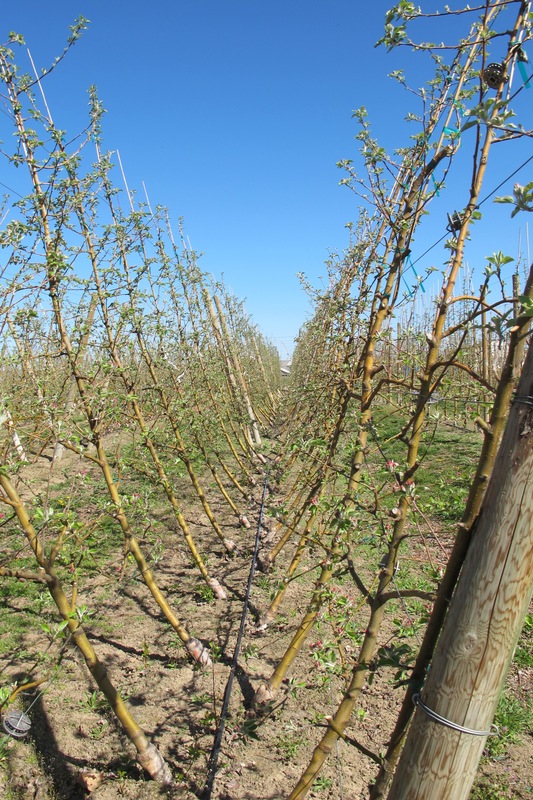 In a sandy loam soil at the WSU Roza orchard in Prosser, trees on both rootstocks performed well. On G41 the canopy volume and height was more consistent when compared to M.9 Nic 29®. 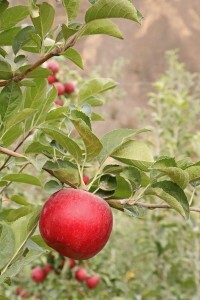 At the Sunrise Orchard in Rock Island, WA the soils are a lighter, variable texture soil. Overall, trees at Sunrise showed less canopy volume than trees at the Roza. 4th leaf trees on G41 at Sunrise were larger with more consistent canopy volume and height when compared to the trees on M.9 Nic 29®. 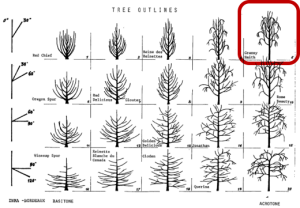 6th leaf trees showed a trade-off between rootstock qualities. At the Roza site where fire blight became a problem, M.9 Nic 29® had a significant loss from tree dying due to fire blight compared to G41. Where fire blight was controlled at the Sunrise site, no tree loss to fire blight was recorded. However, in single leader training systems, excess vigor in G41 showed less crop and more overly large fruit compared to M.9 Nic 29® at the Sunrise site. WA 38 (S-alleles S5 S24) blooms during the latter part of the bloom period. Manchurian (S5 S39b) crabapples are not a good selection because they flower too early and because of 50% pollen incompatibility. Snowdrift (S25 S45b), Mt Everest (S20 S26), and Indian Summer (S26 S50b) tend to bloom during the WA 38 bloom. A mix of the first two pollinizers is recommended to ensure pollen is available during the bloom. Indian Summer can cover the beginning of bloom in some years. Other pollinizers like Frettingham (S24 S25) had only 50% of the pollen compatible with WA 38. Because WA 38 tends to thin to single blooms. A larger number of pollinator trees is recommended (approx. 10% more trees). Reference: Sheick R., Serra S., De Franceschi P., Dondini L., Musacchi S., 2018. Characterization of a novel self-incompatibility allele in Malus and S-genotyping of select crabapple cultivars. Scientia Horticulturae. 240: 186-195. 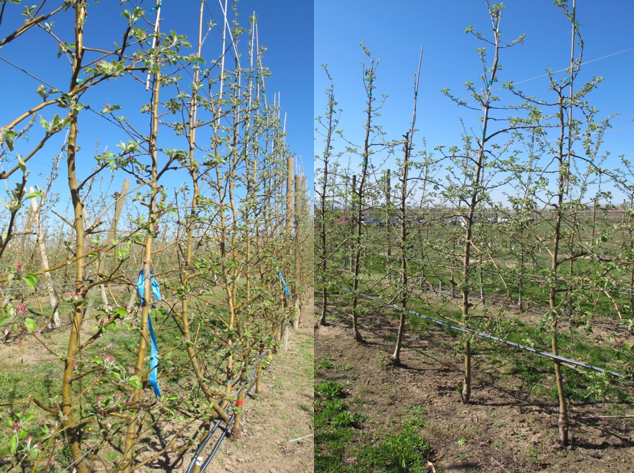 Three training types were tested from 2013 to 2018: Bi-Axis, Spindle, and European V.
Bi-Axis is a training system based on two axes/leaders that can be obtained by the growers heading back the tree in the field or budding two buds on the rootstock in the nursery. The bi-axis in WSU trials was produced in the field by initially heading back the tree to a 1.5 foot-high trunk immediately after planting. After shoots began to grow the stem was headed back again at approximately one foot removing the strong vertical shoot and leaving two shoots in the lower portion of the trunk that generally exhibited a more open crotch angle. 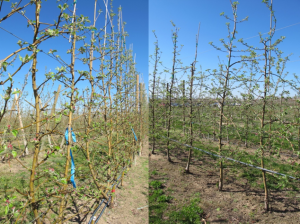 Nurseries achieve two uniform axes by double chip budding (Bibaum® tree). This technique has been patented by Vivai Mazzoni in Italy and the USA. In both cases, the two axes are grown as small independent spindle trees. Compared to a single spindle two axes tend to reduce vigor. Like the spindle system, bi-axis systems generally have high early yield and uniform light exposure. This system doubles the axes/fruiting units without doubling the tree cost. WA 38 has performed well in a Bi-Axis system (Figure 2). The Bi-Axis provides good light penetration for uniform color and thin fruiting walls appropriate for mechanical pruning and harvest. Trunk spacing for the Bi-Axis WA 38 would be at 4 x 10 foot to 4 x 11-foot spacing in most soils. Bi-Axis might not be appropriate for poor, low vigor soils or low vigor rootstocks. Vigor reduction. Bi-Axis splits the vigor which can allow the use of a more vigorous rootstock (i.e., G41) with no negative impact on cropload. Good fruit coloring. The Bi-Axis system has a thinner canopy which exposes the fruit to more uniform light which is an advantage for WA38 like most bi-color varieties. Ability to mechanize and automate cultural operations. Spindle systems are designed to maximize profitability through early yield, improved fruit quality, reduced spraying, pruning and training costs. Trees are planted at high density on dwarfing rootstock. There are no permanent limbs within the canopy but instead, renewal cuts are made each year to remove limbs too large in diameter for the canopy (Limbs bigger than 30% of the diameter of the trunk should be removed). WA 38 performs well when trained to slender spindle (Figure 3). Good light distribution results in good coloring and the system architecture allows for automation and mechanization. WA 38 spindle spacing would be 3 x 8 foot to 3 x 12 foot. Good fruit coloring. WA 38 on Spindle tends to color well throughout the canopy which is important for this bi-color fruit. On a thin spindle fruit wall WSU trials have been able to harvest 60-90% of fruit with good color in the first pass. Ability to mechanize and automate. Difficulty of pruning inside the V. In a blind wood-prone variety like WA 38 proper pruning is particularly important. Tipping the ends of branches to break apical dominance and induce bud swelling is difficult to perform on the inside of the V.
Difficult to mechanize and automate canopy and crop inside the V.
Shade. The V shape canopy can create shade in the lower parts of the canopy. In a European V all the fruit inside the V will be affected by shade from the leaves. WA 38 fruit in the lower part of the canopy tend to be low color. 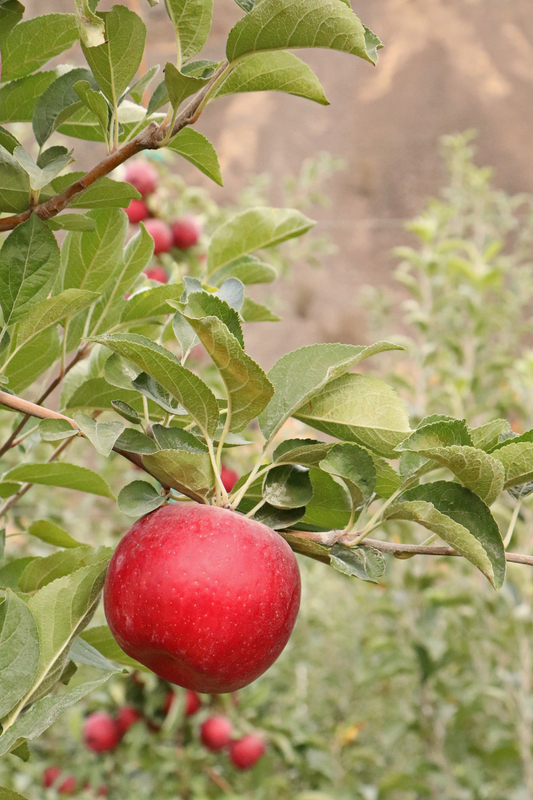 Apples produce the plant growth regulator auxin in their growing meristems and shoot tips. Auxins flow downward inhibiting bud break for a distance below the growing shoot tip. A shallow cut into the cambium and phloem interrupts the flow of auxins to the dormant buds and these buds will start to grow. The girdle should be very shallow, just into the bark and the green part [cambium], about a millimeter deep. The best time to girdle or notch is in late February to the beginning of March when the sap is starting to flow. During this period the tree should heal within 2-3 weeks. Girdling and notching can be very effective for WA 38 to reduce its tendency towards blind wood. Girdling should be done approximately every foot of the trunk on second-year trees. It is critical not to girdle too deeply. This technique can be used to remove shoots that are growing too much. It can be performed by pinching the shoot apex to reduce shoot elongation. Preliminary work with apogee has had a good response. Three applications of apogee in the third leaf at 12 oz (eight, thirteen and twenty-three days after bloom) resulted in short shoots with more bud break. Treatments were done after the previous year’s girdling, notching and stubbing had adequately filled the space. Mechanical pruning has been evaluated in the Roza and Sunrise Orchard locations in spindle, bi-axis and angled canopies. The horticultural response from mechanical pruning is directly correlated to the amount of wood accessible to the hedging blade and timing. The hedger will only cut wood that is in the row and at the depth of the blade. Timing options include dormant, 12th leaf stage (early June) and 22 leaf stage (mid-July). Dormant timing will reduce your canopy depth and “set the canopy box”. The 12th leaf timing breaks apical dominance and pushes latent buds located down the stem, near the trunk. We have not seen any positive or negative results from 22 leaf timing. We continue to analyze cropload and fruit quality in trees mechanically pruned and pruned by hand. 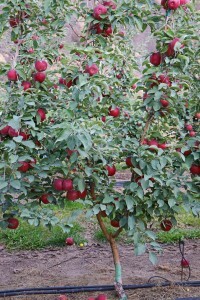 Fruit set is lower in WA 38 than other varieties. Many varieties set 4-5 fruits per cluster. 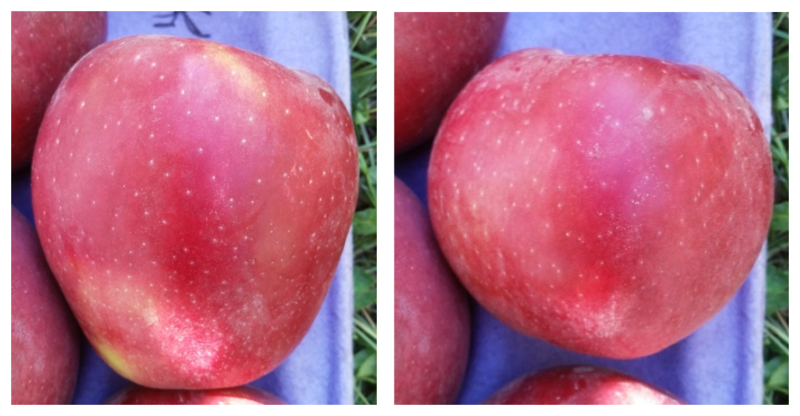 WA 38 tends to set only one fruit per cluster, occasionally two, similar to SweeTango. It is important to be very cautious when thinning WA 38 in order to maintain sufficient fruit set. Bloom and post-bloom thinning should be approached with great caution. Recent research has found that it is difficult to overcrop this variety. 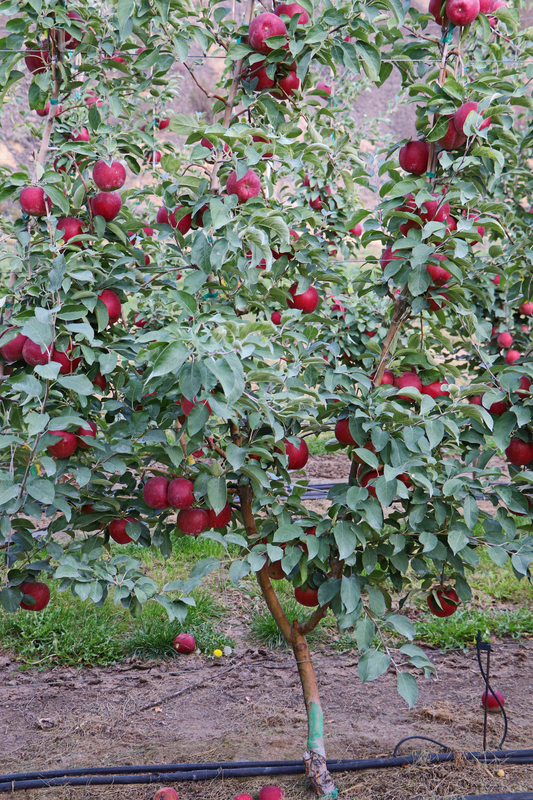 Maximum cropload is seven fruit per tree cross sectional area. High packout potential. It has a very narrow size profile with typically 80-90% of fruit in 4 size classes. Storage potential is six months or longer in refrigerated air storage. 12 months in controlled atmosphere storage is expected with or without 1- MCP. It has none of the common storage disorders (water core, internal browning, sensitivity to carbon dioxide or low oxygen, superficial scald, chilling injury, or shrivel). Shelf life is exceptional. It retains firmness, crispness and flavor during several weeks of post storage shelf life (at room temperature). Eating quality. It has a balanced sweet/tart flavor, firm with excellent crispness and juiciness. It maintains fruit flavor and texture throughout storage. The flesh does not brown easily. Sunburn. It is not particularly susceptible to sunburn. There was some buckskin early on in 2016 but it colored over with no internal browning or water-core. In severe cases, water-soaked areas can be observed under the skin of affected areas. Leaf marks. If it hangs under a leaf or other apples hang close you will get light colored areas. Stem Punctures are possible and incidence usually fluctuates, around 5% of fruit is affected. Research has shown that punctures can be reduced to an average of 2% with clipping. Green spot. This physiological problem expresses as green to dark colored spots in the skin of the fruit. They do not start in the flesh and move up into the fruit like bitterpit. The cause is not yet known. Lauri, P., Laurens, F. 2005. Architectural types in apple (Malus x domestica). In Crops: Growth and Biotechnology. Ed. R. Dris. World Food Limited, Helsinki, Finland. pp 1300-1313.